The STUDIO OF SUSTAINABLE DESIGN is an architecture and consulting organization composed of a diverse group of professionals who help individuals and companies build with sustainable methods. We focus on designing with an ecological approach toward a closer relationship between the earth and its people. The Studio, directed by Architect Bruce Millard, offers design and consulting services for building human environments, while protecting the health and beauty of the surrounding natural environment and its inhabitants. Bruce Millard's experience in architecture and construction spans more than forty-five years. He studied, worked, and taught in the fields of architecture and urban design in Philadelphia from 1969 to 1985. As a partner in the award-winning design firm Alley Friends Architects, Bruce directed the firm’s energy-conservation and renovation work. A pioneer in solar and alternative energy, conservation design, and use of recycled materials in the 1970s, Bruce maintains an architectural focus on the design and use of sustainable building materials for personal environments and livable communities. 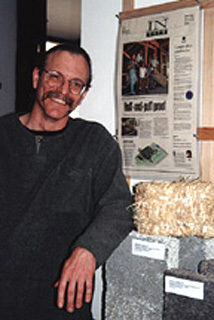 Bruce has practiced architecture in Sandpoint, Idaho, since 1985. He is a founding member of the Inland Chapter of the Northwest EcoBuilding Guild and served as President of it’s Regional Board of Directors from 2002 to 2008. He is also a supporter of national and regional green building organizations. Bruce lectures on solar design and green design, and his work has been published locally and nationally. At the Studio of Sustainable Design, we work on a personal level with you. We want to help you create an inspiring, healthy, sustainable environment for your family, your business, and your employees: an environment that benefits the world, instead of borrowing from the one our children will inherit. Our designs grow from your urban or rural site. We integrate elements of sustainable design, materials and systems with your needs and desires to provide an ideal space. Our residential projects are built of sustainable construction materials, including natural fiber, sustainably harvested or reused wood, and healthy finished interiors. We combine them with fire-resistant exterior walls made of recycled wall systems, and walls built of straw bales. These residences blend well with both natural and urban environments, while providing sun-filled, spirit-nurturing living interiors. Our designers care about the world we inhabit. We believe our collective actions can make a positive difference and influence future generations to grow in a sustainable manner. The Studio is housed in a load-bearing straw-bale structure. We are involved residents of the unique resort community of Sandpoint, in Northern Idaho. To reach Sandpoint take the train (Amtrak), or fly into Spokane, WA, and drive 75 miles to the Long Bridge that crosses Lake Pend Oreille. You are welcome to visit or contact us. The Studio provides all levels of architectural services for every aspect of your project. We have the experience to complete full architectural and engineering services, from site massing and programming to post-construction review. We enjoy consulting with you on any phase, size, or budget. We want to help you create your special environment, whether it is a small renovation or a large multi-use complex. Our first meeting about your project is free, and usually lasts an hour. This conversation can be held on the phone, by e-mail, or at our Studio. We will ask you to bring all of your ideas to date, any plans you have collected or drawn, and most importantly, your vision for the building. We will discuss your thoughts, design ideas, and special requirements and conditions. Then we'll present and review various levels of our professional services, and how we can help you in the most effective and productive manner. We will also explore how our energy relates to each other. A successful project requires pleasant, sharing, and open dialog. We want to develop a high level of trust with you. "...the architect, who shared our vision of a compact and natural home, has a great feel for creating artistic, inviting spaces." "Sustainability refers to a very old and very simple concept -- the ability to keep going over the long haul. Think of it as extending the Golden Rule through time, so that you do unto future generations as you would have them do unto you."